The time base for this sequence is not known as it is taken from a televised slow motion recording however, the duration between each exhibited frame is constant. There currently is a video available authored by Popov's coach Gennadi Touretski. 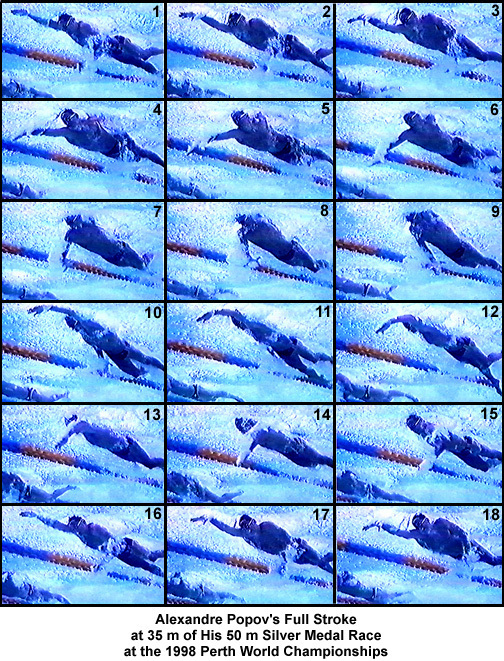 In that video sequences of training speed swimming and drills are shown. Several features that are stressed in that medium are not evidenced in the sequence shown below. This is another clear justification for differentiating between training, drills, and race swimming techniques. They are all discretely different and warrant independent study without any inference of one form transferring to another. Frame #1: The right hand entry is made with the arm at full extension and the hand flat. Being a sprint sequence, the time the recovering arm would have been out of the water would have been minimized consequently, the right arm entry occurs while the left arm is still in its propulsive phase. The left arm is clearly applying force well under the body with the hand/forearm surface although the upper arm is near the completion of adduction. Because of sprint timing, it is likely that some of the left arm force has been used to counter-balance the recovering right arm. The left leg prepares to kick to counter-balance the first vertical force application of the right arm. The head, torso, hips, and leg alignment is very well streamlined. Frame #2: The right arm pull commences immediately upon entry. Slight flexion of the wrist and elbow direct the pull downward and possibly inward although it still remains well in front of the shoulder. There is no misdirection of force application laterally ("outsweep"). The left leg begins to kick to counter-balance the initiation of the right arm pull. The left arm continues to propel backward and under the body with the hand/forearm surface although adduction is complete. The head is well down looking mostly toward the pool bottom. The right leg begins to rise preparatory to kicking. Frame #3: The right arm pull increases in vigor with more elbow flexion and the shoulders rolling to the right. The left arm begins to extend with the hand still moving directly backward although the upper arm is being raised to initiate extraction. The left leg kicks in concert with right arm force production. Frame #4: The right arm continues to apply force primarily downward but well in front of the swimmer. The shoulders have rolled more and the right shoulder is elevated fully to give the greatest possible reach forward. The left leg kick is almost completed. The left arm extraction is well under way with only the hand and partial forearm still in the water. The right leg begins to kick to counter-balance the left arm's vertical movement. In his video, Gennadi Touretski talks of a "kayak principle" where he alludes to the hands being opposite each other as are the blades at the end of a kayak paddle. The inference from that analogy is that in swimming one propelling surface should not start propulsion until the other is diminishing in its propulsion. Positions that demonstrate that principle have been illustrated in the analyses of Brooke Bennett and Claudia Poll. In this frame #4 there is a demonstration of this "kayak principle": the right arm initiating its pull from well in front while the left arm is extracted. This "opposition" produces the desirable outcome of almost a continuous application of propulsive force, something which is not possible in an exaggerated overtaking stroke or some of the other unfounded proposals for arm-timing that exist in today's swimming-coaching literature. Frame #5: The right shoulder is fully extended and the force of the right arm is now being directed mainly backward. The shoulders have rolled to their maximum and are stationary so that adduction of the upper right arm can begin. The hips have not rolled as much as the shoulders. The head has rolled slightly to the left. The right foot kicks to counter-balance forces created by the recovering left arm. Frame #6: The vigor of the right arm pull is evidenced by the amount of upper arm adduction that has occurred since the previous frame. The amount of bend in the right arm elbow is not as much as would be normally exhibited by a distance swimmer. This is because a sprinter is not concerned with "allocating energy to avoid lactate build-up" but rather has to maximize leverage to produce the greatest beneficial force. Sprinters will usually swim with longer arms and less elbow bend than distance swimmers. The right leg kick is nearing completion as the recovering left arm has passed its maximum height. The left leg begins to rise preparatory to kicking. Frame #7: The use of the hand/forearm as a propelling surface is clearly demonstrated with the right arm as adduction continues to be the source of force production. The left leg is poised to kick. The head rolls back to the right as the left arm recovers. The shoulders begin to roll toward the left. Frame #8: The right arm propulsion continues to be powered by adduction, which is near the end of its range of efficient motion. Force is still applied by the hand/forearm surface. The left leg begins to kick to counter-balance the final propulsive surge and extraction of the right arm. The head turns more to the right. The right leg rises preparatory to kicking. The shoulders continue to roll. Frame #9: The propelling right arm extends but continues to push back although only with the hand. The shoulders are close to being flat. The left leg kicks. Frame #10: This is a classic picture of what this writer believes to be Touretski's "kayak-principle" position. The right arm is extracting although the hand continues to apply force. The left arm has entered well in front of the swimmer but with the elbow and wrist already partially flexed. As the right arm propulsion is completed the left arm's starts. The head looks well to the right even though there will be no breath taken. The right leg kicks to counter-balance the left-arm entry vertical-force component. Frame #11: The left arm bends at the elbow, the upper arm begins to medially rotate at the same time as the shoulder is fully elevated, and the wrist remains slightly flexed. The absence of any "outward scull" is obvious. The right leg kick is near completion. The head looks to the right. The right arm is close to being extracted. Hip rotation is well behind shoulder rotation. The swimmer's streamline is clearly visible. Frame #12. The left arm hand/forearm surface is positioned to apply force as adduction of the upper arm commences. The direction of force application is obvious: backward with a minimum of lateral dispersion. The right leg kick is completed. The shoulder roll is at its maximum angle so that left arm adduction occurs on a stable base. The left leg prepares to kick. Frame #13: Left hand/forearm force application is backward and powered by upper arm adduction. The left leg kicks to counter-balance the vertical force component of elevating and recovering right arm. The hips never do rotate as much as the shoulders. Frame #14: Left hand/forearm force application is clearly demonstrated. The right leg is positioned to kick. The head is returning to look directly to the bottom. Frame #15: Left arm adduction is nearly complete as the right leg begins to kick to eventually counter-balance left arm extraction. Frames #16-#18: The movement sequences in frames #1-#3 are repeated. This sequence shows Alexandre Popov sprinting hard. His development of continuous force application (the "kayak principle") and the use of the hand/forearm-propelling surface supported on a streamlined posture are very notable features of his stroke and are worthy of emulation. What also is remarkable in this sequence is the number of "current" coaching theories and technique features that are not exhibited. It dispels much of today's freely-dispensed misinformation.